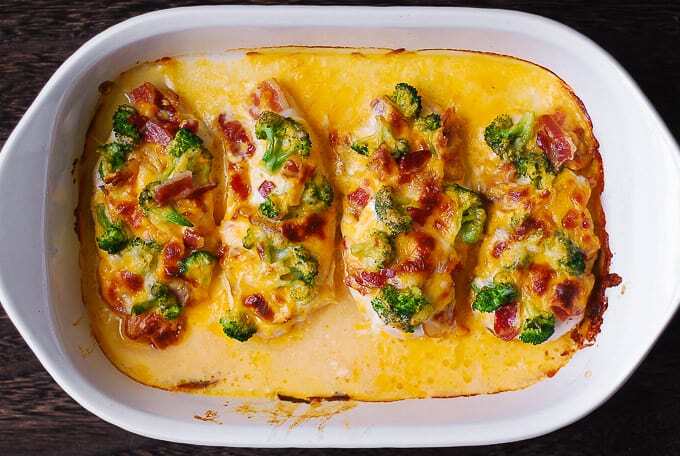 This easy Baked Ranch Chicken with Broccoli and Bacon is a one-pan meal made in a casserole dish. Minimal clean-up. Perfect for busy weeknight dinners, as meal prep, or to freeze. Only 6 ingredients. 30-40 minutes to make. Low-carb, high protein recipe. Sometimes all you need is a simple recipe for dinner. 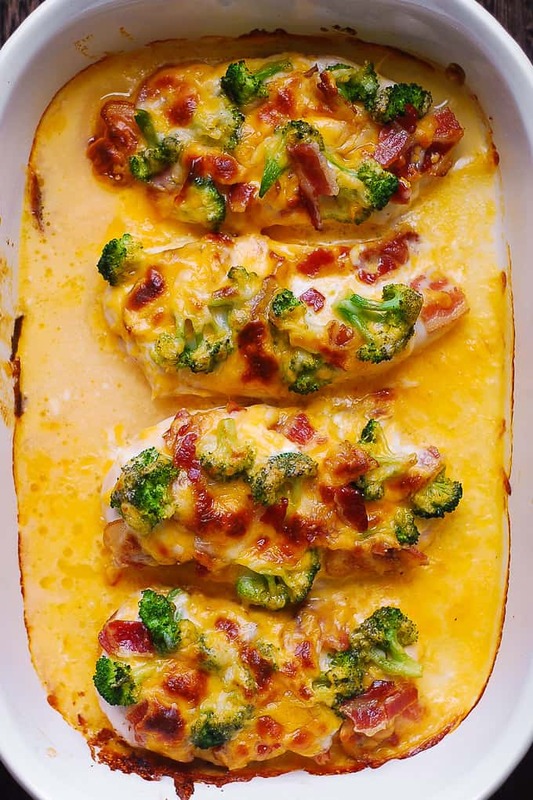 This ranch chicken bake is exactly this kind of basic recipe. There is nothing complicated about this ranch chicken. All you have to do is add all the ingredients in a casserole dish and bake. 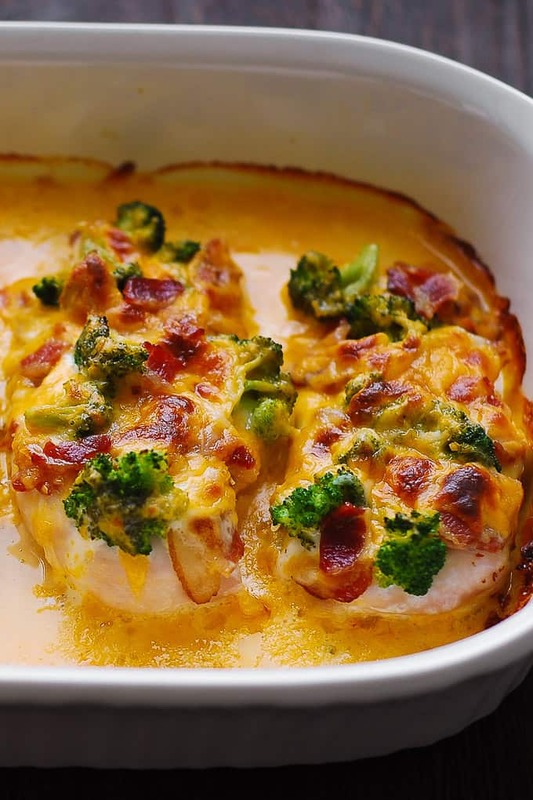 This dish is very similar to my super popular broccoli bacon cheddar chicken bake and a KETO-friendly bacon cream cheese chicken bake. Use boneless and skinless chicken meat, such as chicken breasts or chicken thighs. Without breadcrumbs, with nothing extra. 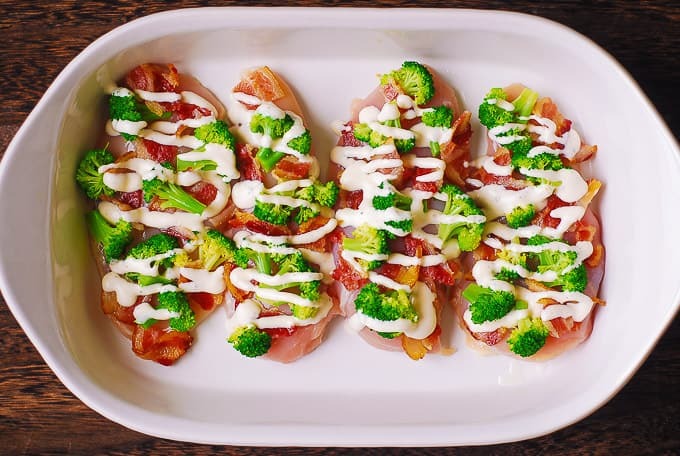 What you get is a delicious oven baked ranch chicken that not only tastes good but also looks good! Use skinless, boneless chicken breasts. Use thin chicken breasts. Or, if you have large chicken breasts, slice each chicken breast in half horizontally. You can also use skinless, boneless chicken thighs. You can use either store-bought Ranch dressing or make your own. No need to add salt. Bacon, Ranch dressing, and the Cheddar cheese add enough saltiness to the dish. Oven-roasted vegetables, such as roasted asparagus, broccoli, green beans, sliced bell peppers, red onions. Potatoes. Serve mashed potatoes or oven-baked potatoes roasted with herbs and garlic in olive oil. Rice. Make Jasmine rice or brown rice. For more flavor, serve wild rice or flavored rice. Cauliflower “mashed potatoes”. Mash cooked cauliflower, add minced garlic and butter, and serve just like regular potatoes. Pasta, such as spaghetti or angel hair pasta. Make your own ranch dressing from scratch. Combine 1/2 cup of mayonnaise with 1/2 cup of sour cream. Add 1 clove of minced garlic, 1/2 teaspoon each of (chopped fresh or dried) dill, parsley, chives, onion powder. Season with 1 teaspoon of lemon juice, salt and pepper to taste. Mix to combine. Make ranch dressing using dry ranch dressing mix. Combine 1/2 cup of mayonnaise with 1/2 cup of sour cream. Gradually add dry ranch dressing mix (to taste) to the mixture, and stir to combine. Do not use breadcrumbs or crushed crackers as topping over your chicken bake. Make your own homemade Ranch dressing that does not include sugar. Combine 1/2 cup of full-fat mayonnaise with 1/2 cup of full-fat sour cream. Add 1 clove of minced garlic, 1/2 teaspoon each of (chopped fresh or dried) dill, parsley, chives, onion powder. Season with 1 teaspoon of lemon juice, salt and pepper to taste. Mix to combine. 2) Add skinless, boneless chicken breasts (or chicken thighs) to the casserole dish. 3) Top with chopped raw broccoli and chopped cooked bacon. 4) Spread Ranch dressing over the chicken. 5) Top with shredded Cheddar and Mozzarella cheese. 6) Bake in the preheated oven at 375 F for about 30 minutes until the chicken is cooked through. 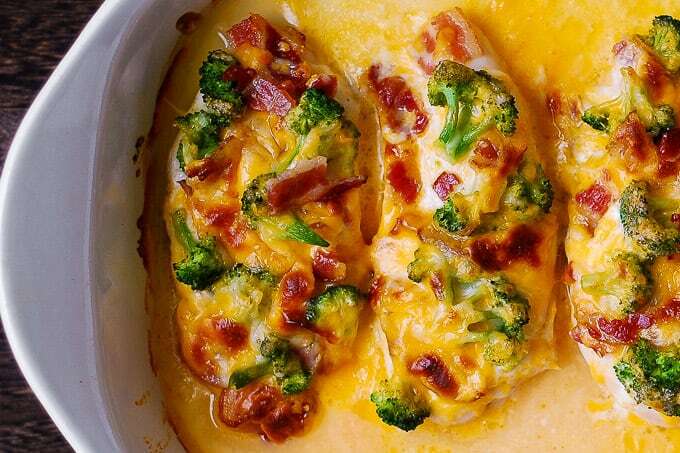 Use the juices from the oven-baked ranch chicken to pour over mashed potatoes or cooked rice or veggies. 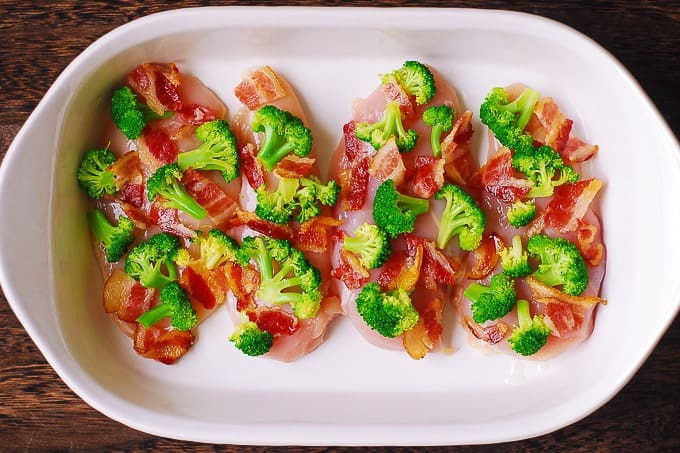 This easy Baked Ranch Chicken with Broccoli and Bacon is a one-pan meal made in a casserole dish. There are only 6 ingredients, and the recipe takes 30-40 minutes to make. Low-carb, high protein recipe. Add chicken breasts to the casserole dish. I used the the oval casserole dish measured 13 inches x 9 inches x 4 inches deep. 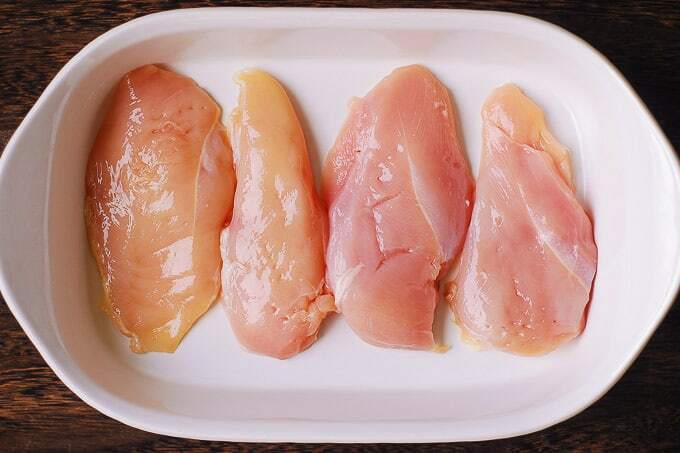 Note about chicken: use 4 thin chicken breasts, or use 2 large thick chicken breasts, sliced in half horizontally each to make 4 thin chicken breasts. Spread Ranch dressing on top. Top with shredded Cheddar and Mozzarella cheese. Can frozen broccoli be substituted? I would thaw broccoli first. Tried this tonight and it turned out great! (even though ranch isn’t a favourite flavour of mine). Is there anything you would recommend to replace the ranch dressing with? If you don’t want to use a Ranch dressing, you can try cream cheese. 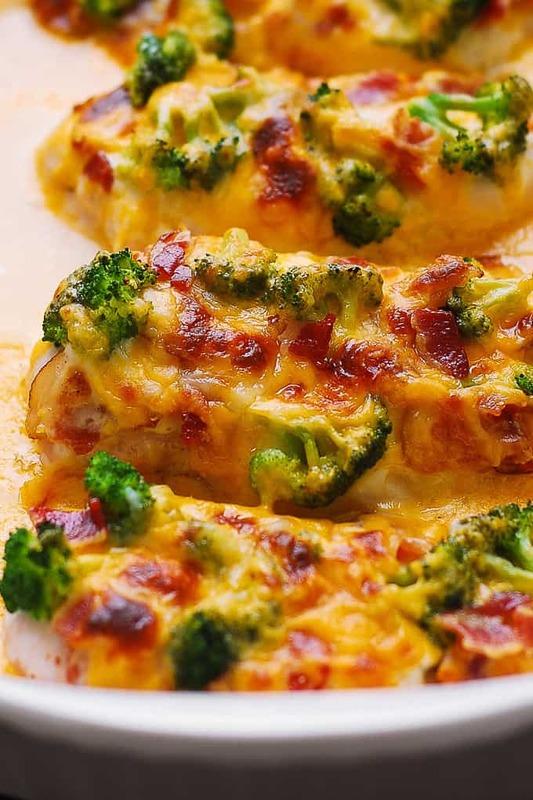 Take a look at this recipe: bacon cream cheese chicken. You can also use spinach and artichoke dip like in this recipe: chicken florentine bake.